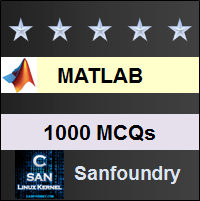 This set of MATLAB Multiple Choice Questions & Answers (MCQs) focuses on “Arithmetic – 1”. 1. What would be the output of the following code (in editor window)? Explanation: C = A + B adds arrays A and B and returns the result in C.
C = plus(A,B) is an alternate way to execute A + B, but is rarely used. It enables operator overloading for classes. Explanation: C = a. *b multiplies arrays a and b element by element and returns the result in C.
3. What would be the output of the following code (in editor window)? Explanation: c=a.^2 raises each element of a to the corresponding power i.e. 2. It will square each element. [12	22	32	42	52] = [1	4	9	16	25]. Explanation: The result is a 1-by-1 scalar, also called the dot product or inner product of the vectors A and B. Alternatively, you can calculate the dot product A • B with the syntax dot(A,B). 5. What would be the output of the following code (in editor window)? Explanation: C = A2 computes A to the 2 power and returns the result in C. The syntax A2 is equals to A*A.
A2 = [1	2;	3	4] *[1 2;	3	4] [7	10;	15	22]. 6. What would be the output of the following code (in editor window)? Explanation: B = cumprod(A) returns the cumulative product of A starting at the beginning of the first array dimension in A whose size does not equal 1. B(2) is the product of A(1) and A(2), while B(5) is the product of elements A(1) through A(5). 7. Create an array of logical values. Find the cumulative product of the rows of A. 8. Find the cumulative sum of the columns of A. Explanation: B = cumsum(A) returns the cumulative sum of A starting at the beginning of the first array dimension in A whose size does not equal 1. If A is a matrix, then cumsum(A) returns a matrix containing the cumulative sums for each column of A. B(5) is the sum of A(4) and A(5), while B(9) is the sum of A(7), A(8), and A(9). 9. Create a 4-by-2-by-3 array of ones and compute the sum along the third dimension. Explanation: S = sum(A) returns the sum of the elements of A along the first array dimension whose size does not equal 1. If A is a multidimensional array, then sum(A) operates along the first array dimension whose size does not equal 1, treating the elements as vectors. This dimension becomes 1 while the sizes of all other dimensions remain the same.